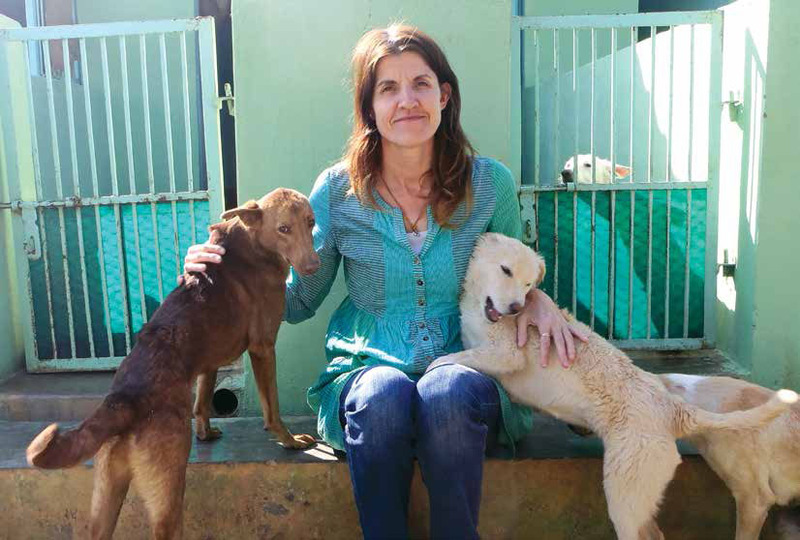 Meet Rachel Wright, the founder of Tree of Life for Animals (TOLFA). It is an animal charity in Rajasthan. Established in 2005 TOLFA has since helped over 1,70,000 animals. In 2018 Rachel was awarded the prestigious International Award by the Royal College of Veterinary Surgeons in recognition of her work. TOLFA’s mission is to provide vital and preventative healthcare to India’s homeless animals and animals belonging to low income pet parents and educate communities about animal welfare and their value and love. I love animals. It’s as simple as that! I don’t think that it came as a surprise to anyone when I became a veterinary nurse after a childhood spent bringing home every waif and stray that I could find. After several jobs in the UK, including at the Royal Veterinary College, I could no longer contain what was to become my second passion in life and that was to travel. For eight years, I travelled the globe doing volunteer work along the way, but in 2001 a seed was planted that started to grow and has been growing ever since. While sitting on a beach in Sri Lanka, a stray wandered near me and she was in shambles. She had an old fracture of one of her legs and was emaciated. I examined her and found that she had a stick across the roof of her mouth that was preventing her from eating. Once the stick was removed, she tucked into my breakfast. She would come to me every day and bring some other dog along, each with their own problem. With my skills learned as a veterinary nurse, a small first aid kit and a bit of time, all of them got better. A month later sitting on a park bench in Pondicherry, I had an enlightening thought, this is what I was supposed to be doing. 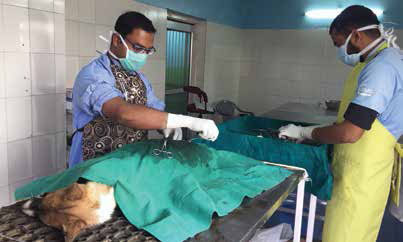 Setting up a hospital and shelter for stray animals that have no possible access to veterinary services. After visiting many more countries looking to find the perfect place, 2004 brought me to the right place. Having been shown a photograph of four stray dogs tied together to a wooden post and left out in the desert to die as the local method of stray control, I knew that I had found what I had been looking for. In April 2005, land had been purchased and construction started for the Tree of Life Animal Hospital in Kharekhari, a small village situated between Ajmer and Pushkar in rural Rajasthan. We opened our doors in October 2005 and our services to animals and people have been expanding ever since. Our facility was started thirteen years ago, which is about two and a half acres. We have 270 kennels that belong to different departments. We have a kennel block just for our rescue dogs, one for our animal birth control dogs, one for dogs suffering from the skin conditions like mange, a puppy yard and kennels, and a quarantine block. There is a kennel for newly arrived dogs, an older dog yard, and a rehabilitation yard for dogs who have been involved in an accident and who have back or leg injuries. We also have sixty three permanent shelter dogs who live here. We have a total of just under fifty staff members and they are assigned to different projects. Our rescue project has the biggest team and within that we have a veterinary doctor and a project supervisor. There are also three separate treatment teams in each kennel area doing treatments from 10am-5pm every day. Animal Birth Control (ABC) team has two doctors and an animal birth control supervisor. There is a team who does operations and the post-op check-ups every day. Dispensary team who sees pet dogs, for which pet parents give us a donation. They also treat rural animals (free of charge). A team of educators and volunteers go out to schools to teach people how to avoid a dog bite and about rabies control and animal welfare. We also have our office and hygiene teams, because at any time we can have up to six hundred animals on site so it can get pretty messy! Last but not least we have our nurturing team, who give love and care to the animals. I believe in kindness (the Indian word ‘ahimsa’) which means showing no harm to any other living being. You should always be kind in everything that you do and it isn’t just medicine that makes an animal feel better. It’s also the love, kindness, and positive energy that you show towards them that helps and goes a long way! We look for homes too! Yes, we do! But it’s quite a struggle to find homes for street dogs, which is what the majority of our work is about. Unfortunately at the moment there is a big craze in India for pedigree dogs. But little do people know that many of them are unsuitable for the tropical and harsh climate. We’re seeing more breeds like St Bernards and Huskies, who are being turned out on the street by their pet parents if they get sick or injured. There are so many desi dogs or street dogs who would make perfect companions, but the real struggle is to find homes for them. We would love more people to come forward to adopt a street puppy because they do make lovely pets. Street dogs are joyful and have a positive outlook on life. As with any dog, when they’re brought up in the right way they are very loving and affectionate. India has the highest amount of rabies cases anywhere in the world. It is a big problem and a lot more needs to be done to make sure cities and villages are rabies free. Hopefully as the rate of rabies decreases, the way people perceive dogs will also improve. And we hope to overcome this obstruction between people interacting with street dogs in a better way. If you don’t want to have the dog inside the house, there are things you can do for your community dogs. When the weather is cold you can put a blanket out for them to lie on, or build them a little shelter outside or near your home. Make sure (especially during the hot weather) that there is water available for them to drink. You can also feed them. In return, that street dog will help to protect your house by being a guard dog and looking out for you. If you have an NGO in your city, call them when you see a sick or injured street dog and their team can come to rescue. A very important one indeed! I think caregivers are under a lot of pressure from other people in their communities, who might not feel the same love for animals. There is a real split. Some people really want the dogs there, while others are a stark opposite and think caregivers are encouraging strays. These caregivers are doing great things. Being kind and supportive towards animals in their own environment is the right thing to do. A major one is that there are still a lot of people who want us to get rid of the dogs. Sometimes we have problems when we have rescued an animal and we’ve gone back to release it in the same spot and people don’t want them back. We have to explain that’s where the animal had originally come from and it must go back there again. Ask the expert… 14 Ways to Celebrate Pooch Love!